The original daytime holiday experience in dance and dine will start its tenth season (that's right 10 years!!!!!) 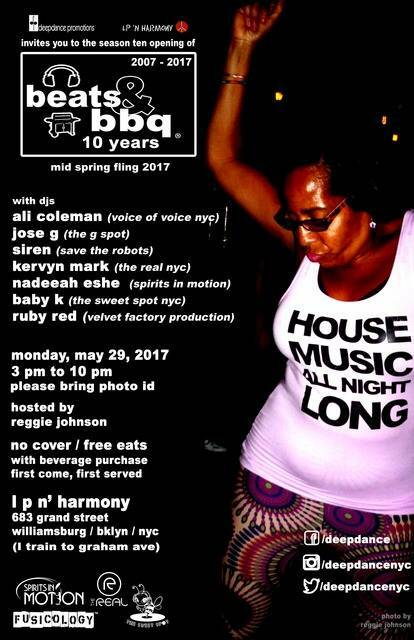 on Monday, May 29, 2016 from 3 pm to 10 pm at LP ‘n Harmony (683 Grand Street), Beats & BBQ will provide the Williamsburg, Brooklyn community its successful combination of “Soulful Dance Music, BBQ and You”. Music is provided by DJs Jose G (The G Spot), Ali Coleman (Voice of Voice), Siren (Save the Robots), Ruby Red (Velvet Factory Production), and Baby K (The Sweet Spot). We welcome for the first time Nadeeah Eshe (Spirits In Motion) and welcome back Kervyn Mark (The Real NYC). Producing and organizing an event in NYC for a decade is not a small feat. Our longevity could only happen with your support. Thank you, NYC dance community for your approval.